The Gippsland Regional Maritime Museum at Port Albert is not just a static museum and archival library research facility. The museum hosts a number of special events and educational activities throughout the year, including book launches, special ceremonies to welcome a new exhibit or achievement, and open days to commemorate significant dates and events. 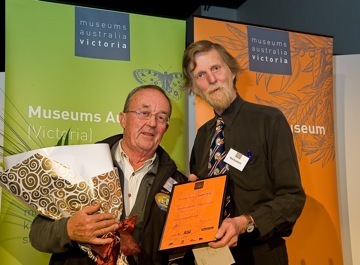 In July 2010 the Museum was adjudged Victoria’s top volunteer run museum at the Victorian Museum Awards..
Committee member Geoff McDonald accepted the award from Rod Quantok at a ceremony at the Melbourne Museum. In May 2010, the state-of-the-art $205,000 archives were officially opened by Eastern Victorian MLC , Johan Scheffer with Wellington Mayor Scott Rossetti and Barbara Wels from Museums Victoria. These archives will conserve the photos, artefact and documents which are of great significance to the development of Gippsland over more than 150 years. The new building was named the “Fred Hobson Archives” to acknowledge the work of the technical archivist who worked over many years to create displays and update the Museum’s extensive data base. BOOK LAUNCH - 'ON THE JACK' - 2008. 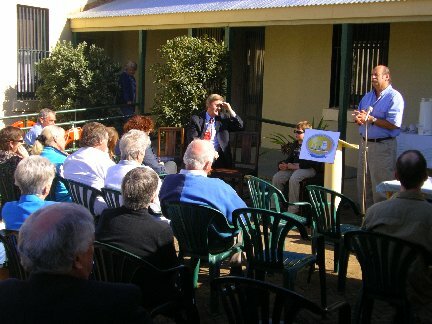 In 2008 , Jack Chenall launched John O’Callaghan’s “On the Jack , a local history of Jack River , another of the Strzeleckis’ “Heartbreak Hills “settlements which sadly almost gone. BOOK LAUNCH - CLONMEL TO FEDERATION, VOLUME 2 - MAY 2007. 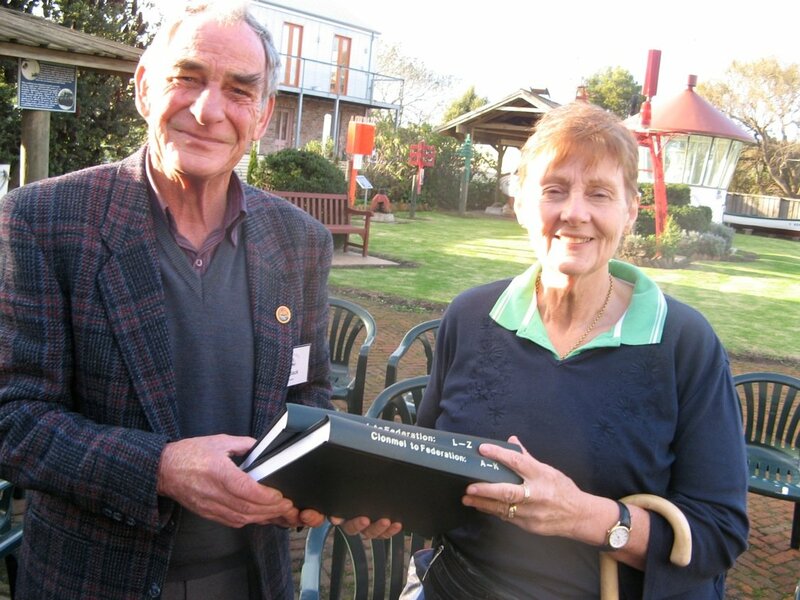 In May 2007, at the Museum, local historian Gwen O’Callaghan launched her 2 volume “Clonmel to Federation -a guide to people in the Port Albert area 1841-1901”. This 800 page two volume reference is destined to become the definitive reference for the many researchers who visit the Museum every year. 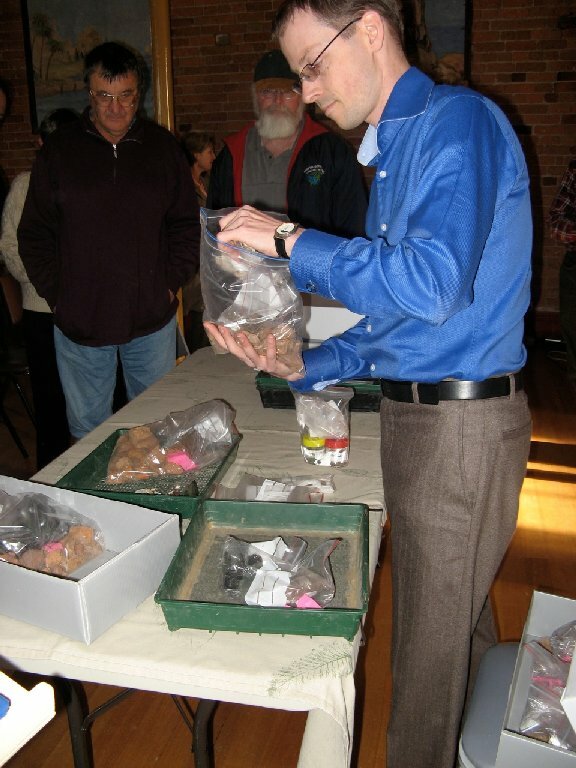 In May 2007, Archaeology Week was celebrated at the Port Albert Mechanic’s Hall with talks by Jeremy Smith from Heritage Victoria who was involved with the Casselden Project in Lonsdale Street Melbourne and archaeologist Alasdair Brooks who had recently completed a dig at the Rev Bean parsonage at Alberton..
BOOK LAUNCH - SEPTEMBER 2006. 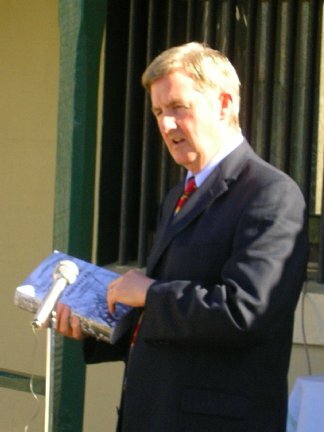 On a glorious sunny day in September 2006, Mr Peter Ryan, the Leader of the Nationals and local MP, launched the Encyclopedia of Australian Shipwrecks by local author Peter Stone. 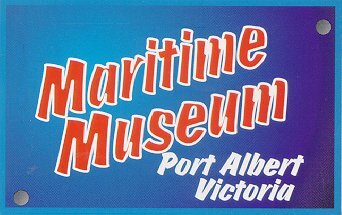 The massive book of 1184 pages listing over 15,000 ship entries is especially dedicated to the volunteers at the Port Albert Museum, and indeed all maritime museum volunteers, .... "who continue to devote their time in order to ensure a continuance of knowledge and appreciation for our maritime history". 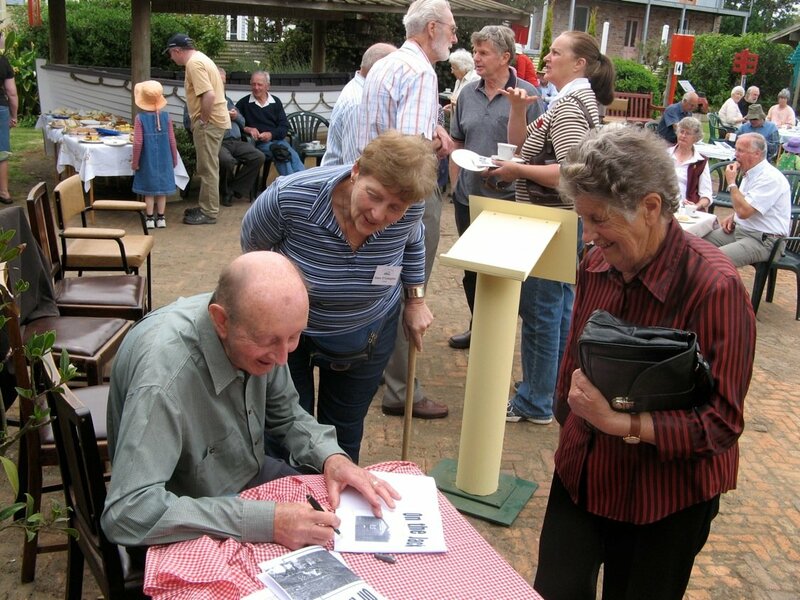 In April 2006, the Port Albert Museum celebrated its 30th anniversary with an Open Day as part of the Tarra Festival. More than 500 visitors availed themselves of the free day and it was one of the busiest days in the Museum’s history. 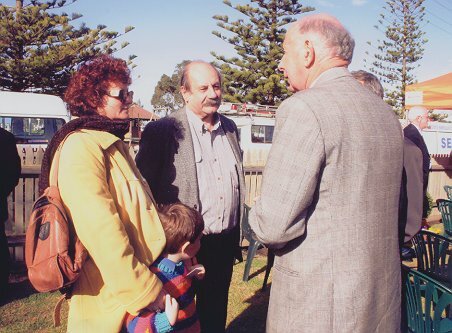 Back in 1986, the Museum was officially opened by the then Federal Transport Minister Peter Nixon . 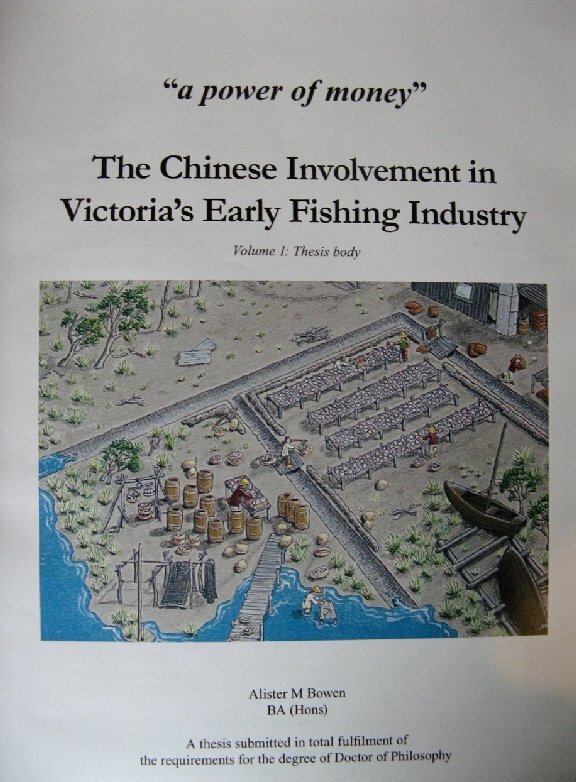 1..In September 2005, Dr Susan Lawrence, Senior Lecturer in Archaeology at Latrobe University officially unveiled a diorama showing the activity of Chinese fish curing activity at Chinamans Point at Port Albert in the 1860s. The diorama was based on the work of Alister Bowen in his PhD thesis, “The Power of Money”. His archaeological dig which took two years and unearthed 29,000 artefacts was described by Dr Lawrence as providing “an exciting new perspective on the role of the Chinese in Australian history”. 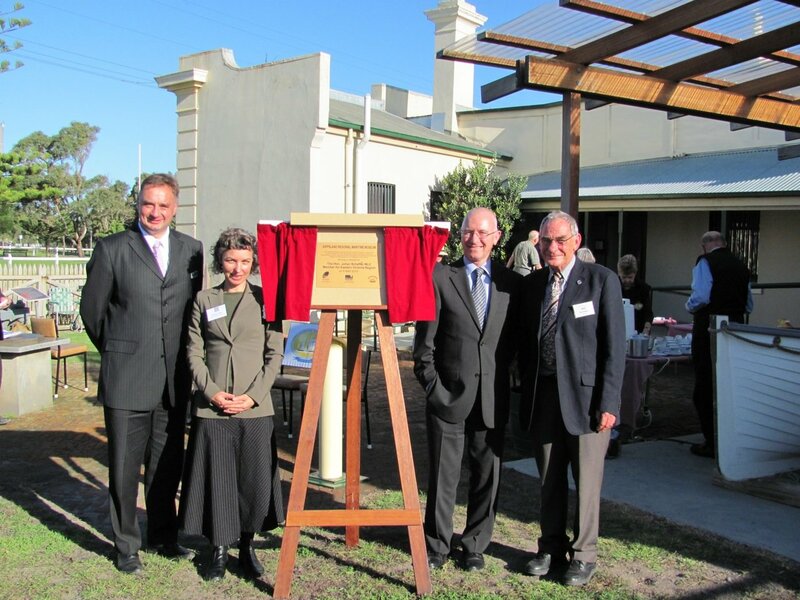 Victorian State Governor John Landy opened the new historic exhibition of the renovated pile light at the Gippsland Regional Maritime Museum at Port Albert in July 2004. Here he chats to members of the public at the ceremony.